Scoopalicious: Celebrate the Fourth With Red, White, and Blue! 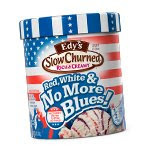 A couple of days ago, Edy's® posted their new flavor: Red, White, and No More Blues! While we always like to be the first with a big ice cream story, I thought I would hold off because this is the perfect July Fourth flavor. At Edy's®, we have a history of lifting spirits. In 1929, we introduced a new flavor of ice cream to bring a smile to people during the dark days of the Great Depression. That flavor was Rocky Road. Now 80 years later, we’re at it again. To brighten the summer, Edy's is proud to unveil a new Slow Churned® Light Ice Cream Limited Edition Flavor: Red, White & No More Blues! Creamy vanilla ice cream with fruity swirls of blueberry and strawberry throughout! Who knew that Edy's® invented Rocky Road -- to lift spirits in the Great Depression, nonetheless! Visit their site for uplifting stories of how people made lemonade out of lemons -- er, um, ice cream out of eggs, cream, and sugar. And finally read the story of the $100,000 winner of their Taste of Recovery Contest. I have yet to try it, but it sounds wonderful -- and very summery!